TABASCO® brand Habanero Sauce --- 1 oz. Limes, juiced --- 4 ea. Red bell pepper, diced --- 1 ea. Yellow bell pepper, diced --- 1 ea. Jicama, shredded --- 1 ea. Ripe avocado, large --- 2 ea. Clean shrimp and slice in half lengthwise; clean bay scallops. In boiling water, poach shrimp for 2 minutes. Place in an ice bath to cool before starting next step. In a bowl, combine TABASCO® Green Pepper and Jalapeño Sauces with lime juice. Add shrimp and scallops. Add red and yellow bell peppers, chopped cilantro and shredded jicama to bowl with shrimp and scallops; refrigerate for 45 minutes. Split avocados, remove pits and score. 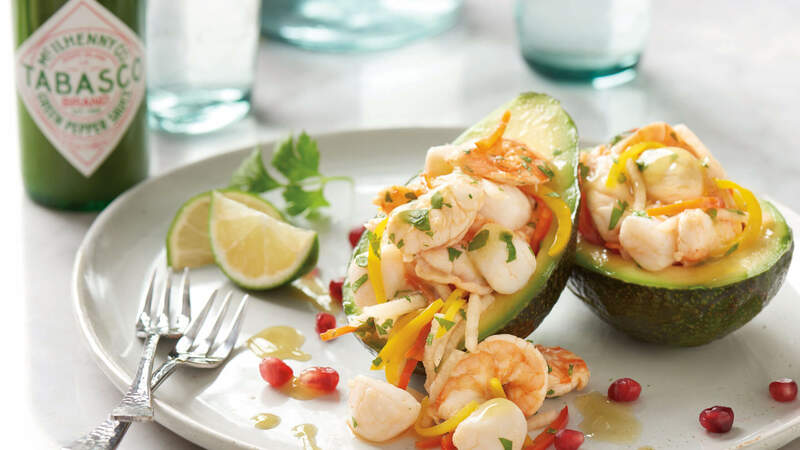 Fill center of each avocado half with ceviche and garnish with cilantro leaves.